From all reports, Thursday night’s public hearing on the proposed North Figueroa bike lanes was just this side of a steel cage death match. I wasn’t there, so what I’ve heard comes second hand. However, from what I’ve read and been told, it rapidly devolved into a shouting match between the mostly younger supporters of the road diet and the mostly older opponents — in other words, those most likely to use the bike lanes and those who probably haven’t been on a bike in decades, and aren’t likely to anytime soon. Yet those who opposed reconstructing the street seemed more that willing to tell the rest where and how they should ride. And where they could go, for that matter. I’m also told that those supporting the bike lanes far outnumbered the opposition. But most weren’t allowed to speak, as the meeting moderator limited the number of speakers to an equal amount from both sides in an apparent attempt at balance. Or maybe it was just to make the opposition seem stronger than it really was. One person who was there sent me her thoughts on the meeting. The anti-bike lane speakers trotted out many of the same previous lies (road tax!, emergency vehicle delays!, think of the children!) but added some surprisingly creative new nonsense this time around. One woman cited North Fig as one of the City’s evacuation routes (in case of nuclear war or something? ), but in the event of a mass evacuation, painted lanes of any kind will be completely disregarded, and there’ll be a quick evac only for the lucky few motorists at the far edges of the evacuation areas who hit the road without delay. Have we learned nothing from the movie Independence Day? As a CERT graduate, I have a backpack full of essentials ready to grab. I’ll be on my bike and five miles out while other evacuees are still running around their homes like freshly headless chickens, grabbing expired batteries and precious family photo albums. When I do hit the inevitable traffic jam, I’ll sluice straight through it, like on southbound Broadway on Dodger nights. Incidentally, Ms. Emergency Prep failed to address the impediment that vehicles parked curbside will present to a fleeing population. One guy actually stated that the proposed road diet is not in compliance with current state or federal regulations. Members of the audience requested citations for this and were barked at to respect the speaker’s turn. I was so dumbfounded at this nonsense that I forgot to observe the expression on (LADOT Bicycle Coordinator Michelle) Mowry’s face, and she was standing right behind him. Upon seeing the guy in the foyer afterwards, I was tempted to follow him into the men’s room to inquire about the source of his misinformation, but of course I refrained. One resident complained of the effects of York’s bike lanes, asserting that the cut-through traffic is now so hideous that children can no longer play in the street. Hasn’t it been over half a century since they were legally allowed to? He stated also that the noise & danger has negatively impacted home values. Surely this gentleman wouldn’t present fabricated information to the public, so I would like to read his thorough analysis of data from the Assessor’s office. Several incredibly delusional speakers suggested the Arroyo Seco bike path as an alternate route. Um, I’ll just assume you’re familiar enough with its current status that no elaboration is required. One of the Seco proponents, who has maybe a decade on me, declared that because she’s older and slower, she doesn’t feel safe riding on Fig, so therefore the Arroyo bike path is a viable alternate. Because of her advanced age? What?? I’m fat and fortysomething, and I’m still taking the lane. North Fig, South Fig, PCH, whenever it’s safest. At night especially, I feel exponentially safer on Fig, as opposed to a dark, secluded bike path out of screaming distance of potential rescuers. And if age-related neurological issues destroy my ability to recognize and/or use the most practical routes, I hope my loved ones keep me off the damn roadways. Mind you, it’s possible I misinterpreted this speaker’s concerns; maybe she was merely suggesting we safely build our stamina by riding all those extra, inconvenient, hilly miles up to our errands at Figueroa’s businesses. One snide woman prefaced her remarks with the accusation that many in the audience are not locals; perhaps she missed the speakers before her, or just doesn’t consider, say, an Eagle Rock Neighborhood Council member local enough. She then stated that she has one child in a NELA school, and another who attends school two cities over. I hope the locals in that city don’t bully her child or insinuate that the kid is unworthy of safe infrastructure because of non-local status. Naturally, this mother made no mention of the fact that her children are most likely to die as passengers in a motor vehicle collision than by any other cause, although she did an excellent job of making it crystal clear that moving her vehicle at faster speeds during rush hour is far more important than their safety. Curiously, nobody mentioned Marmion Way as an alternate (I was late, though, so I may have missed this), and pretty much everybody, whatever their opinion of the proposed road diet, seemed repulsed by the idea of a sharrowed lane. Cedillo (CD1 City Councilmember Gil Cedillo) wasn’t even in the audience for most of the public comment session. Afterwards he spouted a trite “agree to disagree” pronouncement and thanked everybody for coming; presumably “everybody” also includes the speakers he didn’t bother to listen to. I’m also disgusted with the segregation of speakers: the opponents of the status quo spoke first, followed by the opponents of the proposed road diet. However, I don’t know whether this was deliberate. I’ll also point out that bike parking was a pain. Most bikes were locked to the chain link fence enclosing the portal of the tunnel created for students decades ago, when our myopic city planners prioritized the almighty LOS over safe routes for non-motorized road users. Others arriving while I was trying to find a suitable spot were instructed to park on the west side of the long dumpster bay on the side of the auditorium. After three failed attempts to lock up (with my extra-long u-lock, btw), I very seriously considered just locking to Josef’s cargo bike, but ended up locking insufficiently to the parking lot’s chain link fence post. I might see about being bike valet at next month’s meeting. Read more in detailed reports from Streetsblog LA and the Eastsider LA. Didn’t get a chance to update this week’s Calendar of bike events last night. 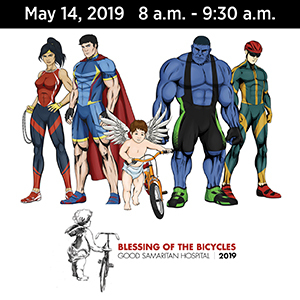 I’ll try to get to that before the weekend is over, since we’ve got a lot going on over the next few weeks — starting with Bike Week next week and the can’t miss Blessing of the Bicycles honoring Ghost Bikes LA on Tuesday. In the meantime, here are a few events to keep you on your bike and smiling this weekend. Temple City officially unveils their new separated cycle tracks on Saturday, including the Old Roots, New Routes Temple City Bike Ride led by CICLE and Eastside Bike Club. Also on Saturday, the Pomona Valley Bicycle Coalition hosts the 2nd Pomona Valley Craft Brewery Tour. The Cyclofemme LA Mothers Day ride offers a slow-paced, family-friendly social bike ride through DTLA on Sunday, followed by brunch at Angel City Brewery. The San Fernando Bicycle Club hosts their semi-monthly beginner-friendly Compagni No Drop Ride this Sunday. And our very own pro cycling world tour event kicks off on Sunday when the Amgen Tour of California rolls through the streets of Sacramento. It gets down to SoCal starting with Stage 6 from Santa Clarita to Mountain High on Friday, Santa Clarita to Pasadena on Saturday and Thousand Oaks a week from Sunday. 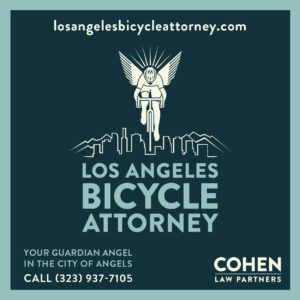 The Los Angeles County Bicycle Coalition announces their Bike to Work Day pit stops, as well as post B2WD happy hours. A petition sponsored by the LACBC calls on legislators to revoke driving privileges for hit-and-run drivers and increase penalties to remove the incentive for drunk drivers to flee. Better Bike updates the status of proposed bike lanes on Santa Monica Blvd through the Biking Black Hole of Beverly Hills, and it ain’t looking good. The matter returns to the City Council on May 20th. 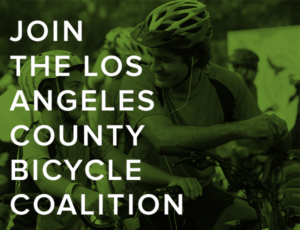 Speaking of online petitions, the Pasadena Complete Streets Coalition has created one calling on the city to protect vulnerable road users by adopting a cyclist anti-harassment ordinance; thanks to Wesley Reutimann for the heads-up. And so the backlash begins, as a Newport Beach council member complains loudly about a recommendation to ban cars, not bikes, from the city’s Back Bay Drive on a trial basis. Temecula gets its first sharrows in Old Town. San Diego gets its first road diet with a spacious new bike lane buffered on both sides, even though Copenhagenize doesn’t like it. Evidently the San Francisco police have determined that bike riders and pedestrians are the real danger on the streets. The Amgen Tour of California marks a comeback from knee injuries for 22-year old American rider Joe Dombrowski after discovering one leg is longer than the other. A writer calls for establishing an Idaho stop law, something I’ve long advocated. And does a far better job of explaining why. The Atlantic looks at where Americans bike and walk, while the Atlantic Cities examines the rise of bicycling in small to mid-size cities, including my hometown. Red Kite Prayer says the key to growing bicycling is more affordable bikes for families. A new Strap ID offers medical and identification information similar to Road ID, but attaches to your helmet strap. Gizmodo offers 29 great ads from the first golden age of bicycling. 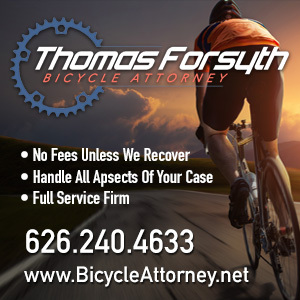 On the heels of attorney Jim Pocrass’ recent post on the same subject, a Chicago bike lawyer offers more evidence that insurance companies aren’t your friend. A new documentary about the late, great pro cyclist Marco Pantani opens in the UK next week; I’ll be in line for that one when it gets here. Unless it already has and I missed it already. A group called the Velominati — get it? — offers 95 rules for bicycling enlightenment, including no wearing of cycling caps off the bike. Former Spice Girl Mel C trains for a triathlon even though she’s afraid of falling off her bike, although she probably faced more risk by tumbling from her stilettos. It may have seemed like a prank to the Irish idiots behind it, but this is the damage a common chocolate bar can do when it’s thrown at a bike rider from a moving vehicle. The Guardian asks how many cyclists have to die before Aussie attitudes change. San Francisco police are worried about confusion over new bike lanes, but the problem isn’t the lanes, it’s drivers who don’t know how to turn properly. And mountain bike trails in state parks are a good thing. But building your own without official approval, not so much.